For applications that demand a heavier-duty cycle. Step up to this enhanced version of our base package. It is ideal for light industry applications. The Value Plus Package comes factory-fitted with options shown above for unmatched reliability in most diversified applications. 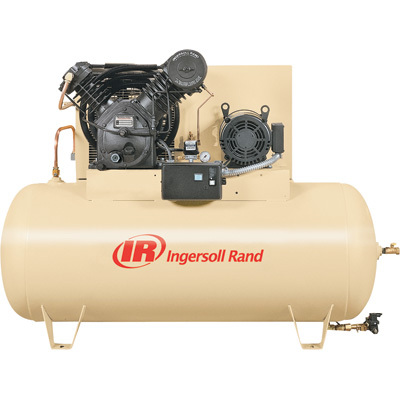 Ingersoll-Rand's Type-30 air compressors provide unmatched performance in the most demanding applications. Recognized as industry leaders for quality, power and reliability, Ingersoll Rand air compressors have been trusted for over 75 years - that's why they make the world's best-selling reciprocating compressor. Each unit includes a two-stage, 100% cast iron pump, ODP electric motor, automatic start stop control with a NEMA 1 pressure switch mounted and an ASME coded air receiver tank. The Value Plus Package adds an electric drain and air-cooled aftercooler. For more information about this Ingersoll Rand product, read the brochure.